More than 100 alleged fake pump boat engines were seized by agents of the National Bureau of Investigation (NBI) 7 and National Capital Region through a search warrant issed by the Regional Trial Court Branch 46 in Manila. For Valentine’s Day, buyers are told to expect prices of roses, the most saleable product on this occasion, to shoot up by 100 percent or more. Primary Homes, which sponsors the Cebu News Digest, prides itself as being “your reliable partner” in building your dream home. In Cebu City, it has Mabolo Garden Flats, “ecological and economical residential condominium equipped with eco-gardens that are truly unique in Cebu.” Check it out in the company’s website. NBI-7 and National Capital Region agents raided Weld Industrial Sales’ warehouse in Barangay Cabancalan, Mandaue City and seized 150 alleged fake motor engines. This was a result of an investigation prompted by a complaint filed by Manila-based Solanda Enterprises, the sole distributor of the product in the Philippines since 1983. The “fake” engines are said to be worth about P1.5 million. According to Solanda Enterprises, they have been receiving complaints from their customers since last year that the motor engines would easily get damaged. Weld Industrial Sales is run by Joy Bagaluyos and Anne Jamaica Chueya. It sells Robin EY Series engines that powers motor bancas and water pumps. But farmers and fishermen have complained that the engines easily break down less than a month after they started using it. The genuine engines are said to be in good condition in the first five years of use. A Cebuana and an Italian tourist are now being watched by the Department of Health (DOH)-7 for possible infection of Middle East Respiratory Syndrome Coronavirus (MERS-CoV). The two were in the same flight with the nurse from Saudi Arabia who tested positive of the disease, said DOH-7’s Regional Epidemiology Surveillance Unit (RESU). They were among the 225 passengers on board Saudi Airlines Flight 860. The two took a connecting flight from Manila to Cebu on February 1. The female resident of Cebu City was already located and is now confined at an undisclosed hospital while the tourist remains at large. RESU-7 chief Dr. Dino Caing said they were directed by the National Epidemiology Center in Manila to locate the two MERS-CoV persons under investigation. Rose prices are inflated during Valentine’s Day because of a spike in demand. Many city-based flower shops have doubled the price of premium rose bouquets from P500 or below to P1,500 to P1,800. A half-dozen bouquet is sold for P800 from P300 while a set of three roses is now P500 from P150. Single long-stemmed roses are sold at P100 to P150 from P50. BANNER STORIES. 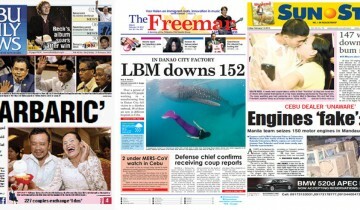 The top stories in today’s issues of Sun.Star Cebu, Cebu Daily News, and The Freeman.